The rise of creativity is a double-edged sword. It creates tremendous wealth creation opportunities for some. Yet it can leave many behind – particularly those in jobs built on routine, and those who do not have the opportunity to gain the skills to participate advantageously in the economic transformation we are going through. 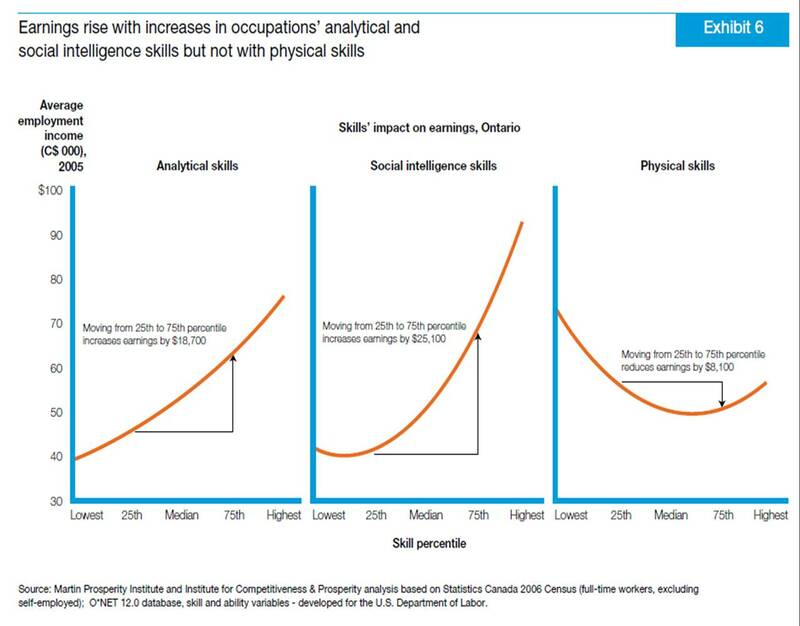 Combine this chart with there second chart that shows how wages grow depending on skill sets (no prizes for figuring out the Routine-physical-oriented jobs correlate with Physical Skills and that Social intelligence skills correlate with Creativity-Oriented jobs). 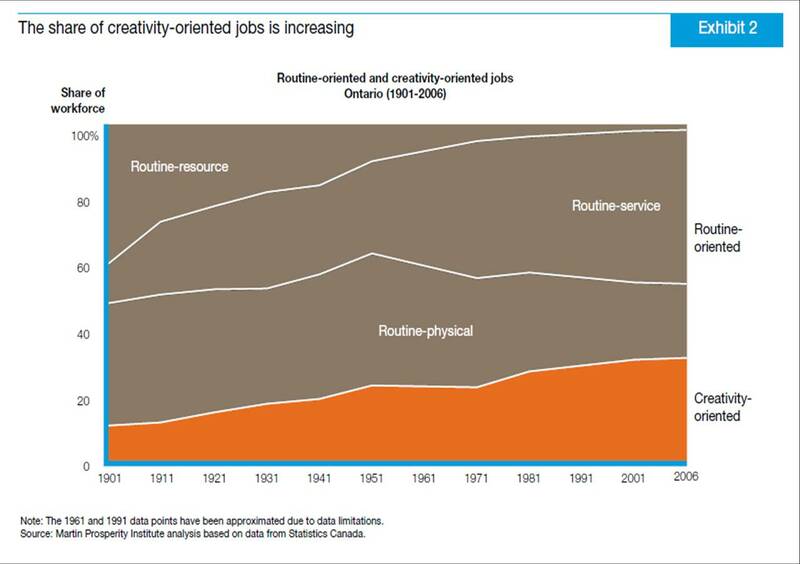 It is easy to see that the possibility of tension between routine-oriented and creativity-oriented workers could grow, especially as wage differences continue to increase. Perhaps the most depressing conclusion to draw from this report is that the stimulus package will do little to address this inequity. A lot items that get funding in such packages (for example, some shovel ready projects) not only generate only temporary growth, but many of the jobs they foster are both becoming fewer – so we are encouraging job growth in shrinking job markets – and have a declining return on investment – so we are encouraging the development of skill-sets in workers that will not increase wages. Consequently, the very actions that traditionally might have helped stave of wage inequality (and in turn class conflict) may actually me exasperating the future likelihood of such inequality. It’s hard to sell funding for R&D and research as these are often seen as “elite” activities, but interestingly they may offer us the greatest hope in reducing future tension and inequality. Sadly, research, science and education received little attention in the budget. This entry was posted in canadian politics, public policy, reviews, vancouver and tagged canadian politics, public policy, reviews, vancouver on February 6, 2009 by David Eaves. A telling sentence in the report says “Those in the creativity-oriented occupations, working long days and nights, rely on those office cleaners, delivery people, and many others in the service economy. In fact, the service economy is the supporting infrastructure of the creative age.”You sure don't hear that thought expressed too often. In highly-networked circles, you get the impression everyone with a working brain is already sending tweets from his iPhone.Considering the relative proportions of the two groups compared to their rewards, the high-priced “creativity workers” not only get disproportionately large pieces of the economic pizza–they stiff the gal who made the pizza, the guy who delivered it, and the expense-account processer in a PEI call center whose time away from the phone is tracked — through a system designed by some other creative type.